When you lock the door using the lock tab on the driver’s door, all of the other doors and tailgate lock at the same time. 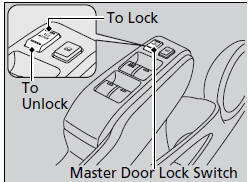 Press the master door lock switch in as shown to lock or unlock all doors and the tailgate. 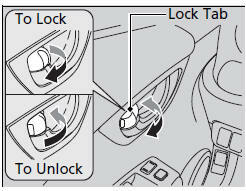 When you lock/unlock the driver’s door and tailgate using the master lock switch, all the other doors lock/ unlock at the same time.